Update: The Verge has a response straight from the horse's mouth. It doesn't completely dismiss the idea of local content playback, but it doesn't exactly justify Google's disabling of the feature, either. Basically it's a "hurry up and wait" situation - we won't know exactly how Google intends to go forward until the developer preview for the SDK ends. We’re excited to bring more content to Chromecast and would like to support all types of apps, including those for local content. It's still early days for the Google Cast SDK, which we just released in developer preview for early development and testing only. We expect that the SDK will continue to change before we launch out of developer preview, and want to provide a great experience for users and developers before making the SDK and additional apps more broadly available. Yesterday a Chromecast software update was sent out for all standard units. The update broke all of the varied hacks and workarounds that have been release so far, closing off some early methods for streaming local and cloud content beyond the scope of the Play Store and Netflix. While software updates often confound the efforts of modders, this was no coincidence, according to well-known developer Koushik "Koush" Dutta. In a Reddit thread on the subject, Koush explained that he believes Google is intentionally closing off access to third-party apps in order to build a walled garden for content. According to Dutta, this would mirror Google's partnership strategy for Google TV. He inquired about the updated software that blocks AirCast/AllCast and others, and received a tepid response that indicated the Google Cast SDK would not be coming to the wider development community until after they get current partner apps working. Google TV (yes, Chromecast is from the GoogleTV team) has a storied history of releasing closed off products, only allowing access to select partners and media companies. I was fairly certain that Chromecast would be no different. My suspicions were confirmed today. 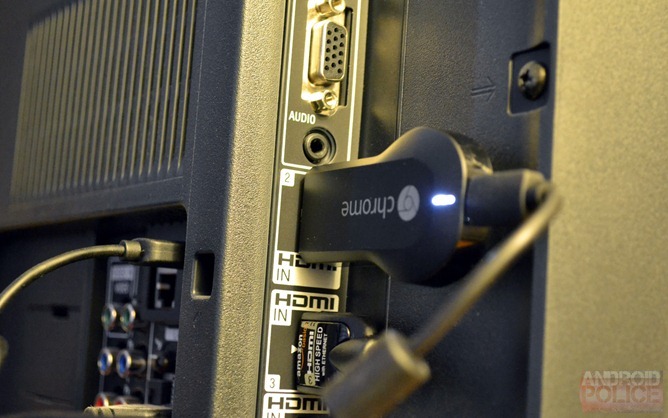 ...Chromecast shipped with no default media player app, or any way to play your own content. As I demonstrated, this is actually very easy to implement. The fact that it did not ship with this by default was likely calculated. They don't want you playing your own content. Chromecast had a "GoogleCastSample" app that could be leveraged as a default media player. Many developers started using this. One week after release, GoogleCastSample was disabled. ...What this all points to: The Chromecast is just a Google TV in a smaller form factor. Yet another box from your TV that delivers the same old tired array of big media apps that you can find on any other cable/tv box. I already have 5 of such boxes (2 Xbox, 2 Apple TV, 1 Roku). I don't need another box to do this. I want a mainstream, open platform, that I can connect to my TV. That would be new. That would be different. While we can't comment on the nature of Google's motivations, it certainly looks like steps are being taken to prevent local media playback on Chromecast (outside of the Google Play suite, anyway). It's disheartening to see Google take such a closed approach to the Chromecast - as Koush notes, the hardware has a lot of potential for cheap and easy streaming to televisions. It will be interesting to see how Google reacts to the inevitable community backlash, or if they react at all. Koush and others will try to work around the changes, but there's nothing stopping Google from plugging any holes in its apparent content wall.